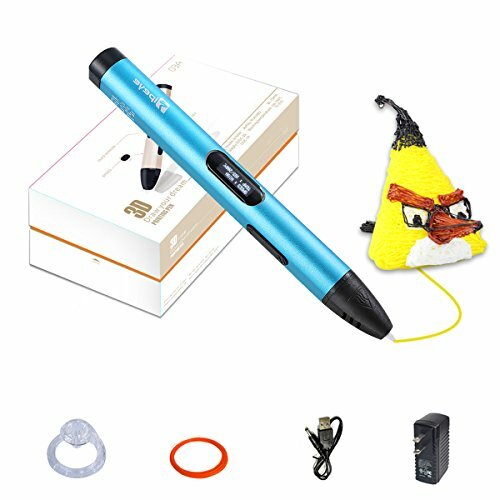 1.Connect the 3d pen to power supply(5V/2A),It enters into standby condition when the LED screen lights. 2If you need to switch to the ABS filament mode please press the "√" button for 3 seconds.The LED screen displays MATEL:ABS mode. 3.Press the "«" button once and load filament refills into the pen. (Please gently push the another end of the filament until it goes through the gear. )Double click the "«" button to start loading automatically. (Make sure that both end of the filament is smooth) 4.Press the "»" button once to start unloading automatically,when the unloading progress is about to finish please pull the filament gently out of the pen. (The unloading progress must be finished in one time. 1. Applicable age: 5 years old and above. 2. Pay attention to the temperature of the nozzle, please do not touch the nozzle during using. 3. Please do not use the nib to touch other hard objects. 4. Please do not use foreign materials to load the hole of filament or the nib. 5. Please do not use other manufacturers' consumables, so as not to cause incompatibility. 6. This product is not waterproof. 7. Make sure that the filament is completely out of the pen and cut off the power supply after using. 8. Please put the pen in a place where children can not touch after using. If you have any questions about this product by TIPEYE, contact us by completing and submitting the form below. If you are looking for a specif part number, please include it with your message.